What is this blister on my lip? There are different types of herpes infections. Cold sores are the result of a previous exposure and infection with Herpes Simplex Virus Type 1 (HSV-1). Once infected with this viral infection, it moves into your nerve root and lives there as long as you do. 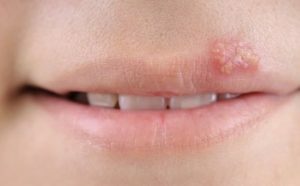 This herpes virus primarily infects the lips and face, while a different virus, the HSV-2, typically infects the genital area. The first sign of a cold sore is a tingling, burning or itching in the affected area of the lip. This is followed by swelling and redness. Within 24 to 48 hours, one or more tiny blisters “fever blisters” appear. These blisters pop and form painful sores “cold sores”. The sores eventually are covered by crusts, which look like scabs. Cold sores may occur after a period of illness or stress, poor nutrition or sunlight exposure. Sometimes there is no known reason for the breakout. Dental procedures that stretch the lip may occasionally trigger the virus. The border of the lip is the most common place of appearance. They may occasionally occur inside the mouth, too. To help to prevent a first herpes infection in children do not let them be kissed by anyone who has cold sores, fever blisters or signs of a herpes infection. However, HSV-1 is very common and spread is very common. There is evidence that using sunscreen on your lips will prevent cold sore from reoccurring when caused by sun exposure. Antiviral medicines for herpes may prevent cold sores from forming. In certain situations, your dentist or physician may prescribe these medicines. If you expect to encounter a known trigger, medicine taken in advance can decrease the chance of a cold sore. Cold sores can spread through kissing and by sharing things that touch the lips and the skin around them, such as spoons, forks, glasses and towels. Some medicines can help cold sores heal faster and relieve pain and discomfort. Acyclovir (Zovirax), famciclovir (Famvir) and valacyclovir (Valtrex) are antiviral medicines for herpes infections. They cannot get rid of the virus from your nerve root, but can treat and clear the active cold sore. These medicines are most effective when they are started before the visible blister or as soon after as possible. These medications also can stop cold sores from popping up in the first place. Some people take them when they know they will be under stress. See our Physicians and P.A.s at Doctors Urgent Care for the highest quality medical evaluation and treatment. We are familiar with and treat cold sores and Herpes infections.